VMI engineers have created nearly a foot of extra floor space which means more room to maneuver even the largest power wheelchairs while maintaining ample space in the vehicle for up to six other passengers — seven passengers total. Wheelchair users will now enjoy Access 360 in the Chrysler: the ability to enter the vehicle and complete a 360-degree rotation without bumping or scraping into anything. 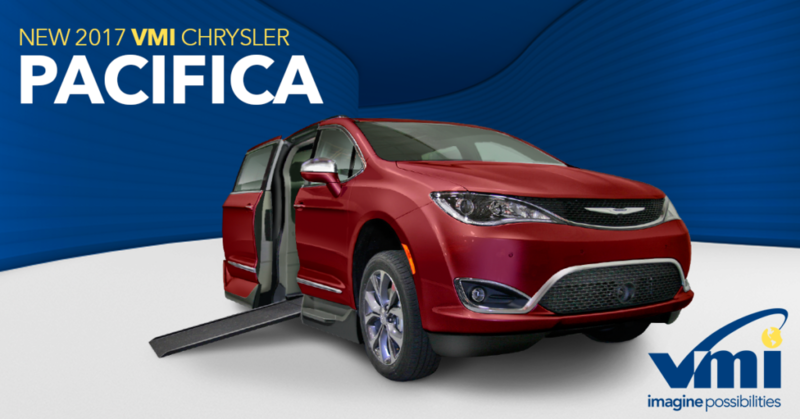 The VMI Chrysler Pacifica offers two top of the line features that make for easier entrance access: its extra wide door opening and its PowerKneel feature. VMI engineers have altered the Pacifica to include a 30-inch wide door opening and 59-inch door height which will allow easier access into and out of the van for wheelchair users. The PowerKneel feature lowers the incline significantly [about an 8 degree incline] which makes it easier for wheelchair users and their caregivers to get into the van. For the first time ever, the VMI Chrysler Pacifica gives wheelchair users the option to switch from driver’s seat to front passenger seat, or they can sit in the second row. Whereas wheelchair users in the past were stuck in one position for the duration of a ride, now wheelchair users can switch from passenger to driver’s seat and vice versa. This feature makes the Pacifica the ultimate road trip van. We know safety is a priority, especially when it comes to transporting the family. It’s another reason we chose to convert the Chrysler Pacifica. This van comes with front and rear parking assist, lane departure warning, forward collision warning plus, adaptive cruise control and 360 degree cameras. The Pacifica’s Parksense park assists give drivers visual and audible warnings when he or she is about to hit an object while parking. The rear park assist also alerts drivers to objects about to come into the Pacifica’s path. The van will automatically stop when necessary to avoid collision. If the driver moves laterally into other lanes without a blinker signal, then the Pacifica will offer visual warnings and gently nudge the van back into its appropriate lane. If the car in front brakes unexpectedly or the Pacifica driver approaches the car ahead too quickly, the van’s forward collision warning plus will provide visual warnings to “brake.” If the van continues approaching the car ahead without breaking, the van will automatically apply the brake to prevent crashing. When the Pacifica is in cruise control but approaches a car ahead traveling at slower speeds, the van will automatically slow down to maintain a pre-set distance behind. If the car ahead stops completely, the Pacifica will also stop, and then will continue once the front car accelerates. The Pacifica uses four separate cameras positioned around the van to offer 360 degree views, making it easier to maneuver through and park in tight spaces. The camera also offers an overhead bird’s-eye view of the van and objects nearby. Perfect for scenic road trips, the top tier edition of the Pacifica offers a tri-pane sunroof — that is, a sunroof that extends nearly the entire length of the roof. Riders in the front, middle and third rows can look up and enjoy the view. The Pacifica’s top tier editions offer a luxury option called UConnect Theater. Customers can have 5- or 8.4-inch screens built into the back of the front row seats for people to play games or watch movies on. USB, HDMI and bluetooth connection is also available, which makes it possible to sync smart phones up to the screens. This option is extremely convenient for families with kids and people who take long trips. Say goodbye to dirt, hair and cracker crumbs. The Pacifica’s top tier editions’ in-car vacuum hose extends from the backseat to every nook and cranny of the vehicle, making cleaning a breeze. This family car’s interior can look brand new and spotless, even years down the road.